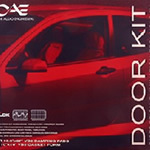 DK1 door kit blocks noise and improve speaker sound quality! The DK-1 Door Kit includes four 13.5" x 37" sheets (13.88 sq.ft.) of VB-2, a thin, moldable vinyl vibration damping material. VB-2 will stretch, mold and bond to the most irregular shapes imaginable. It is ideally suited to replace the plastic vapor barrier behind the door panel. Included in the DK-1 Door Kit is one 10" x 10" square of VB-5, a thin neoprene gasketing foam. This material is used in small pieces to eliminate any potential squeaks, rattles or buzzes caused by linkages, cables or harnesses. 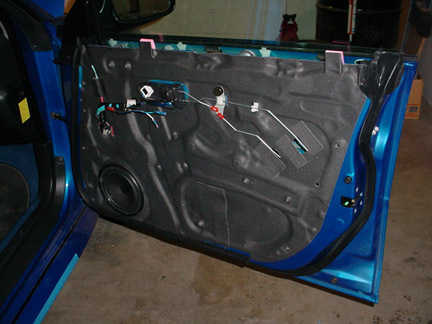 The DK-1 Door Kit contains enough material to damp two average size car doors. You'll be amazed at the dramatic improvement in sound quality from door mounted speaker systems. Install it today and hear what you've been missing! Subaru WRX passenger door treated with VB-2.